We’d love your help. Let us know what’s wrong with this preview of Rouletabille chez le Tsar by Gaston Leroux. 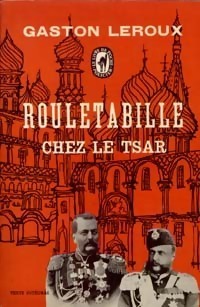 To ask other readers questions about Rouletabille chez le Tsar, please sign up. This entry into the Rouletabille series was not as endearing as the previous books were. Even though it was still very good, I don't know I didn't have the same feel after finishing it like I did with the first two. I miss that Sinclair wasn't apart of the adventure (he is after all Rouletabille's Watson) like the previous book it ends on a cliffhanger as Rouletabille returns to Paris. - Rouletabille actually was shown to not be a step ahead of everyone in this book This entry into the Rouletabille series was not as endearing as the previous books were. Even though it was still very good, I don't know I didn't have the same feel after finishing it like I did with the first two. I miss that Sinclair wasn't apart of the adventure (he is after all Rouletabille's Watson) like the previous book it ends on a cliffhanger as Rouletabille returns to Paris. - Rouletabille actually was shown to not be a step ahead of everyone in this book, he actually gets somewhat sidetracked by a woman. - The female characters are MUCH better in this book than the previous books. - The book makes connects to the two previous novels, which is always fun. - He's not so snarky as he is in the first book. - For some reason Gaston Leroux is mention as have been in a hotel there by Rouletabille. I mean WTF? - The fact that conveniently every person Rouletabille meets knows French, or at least some. I mean the entire novel takes place in Russia. - None of the other supporting characters from the previous book are in this book. - It takes awhile for the main plot to really start. I found this book during an aimless exploration of Kindle deals. I chose it strictly by chance but would later discover that the author, Gaston Leroux, was the original author of Phantom of the Opera. The story, as it turns out, is one of a series that follows the exploits of Joseph Rouletabille, a French reporter/detective. In this case he is brought to Russia by the Czar to protect General Trebassof, whose assassination has been plotted by the revolutionaries—the Nihilists. Rouletabille is aide I found this book during an aimless exploration of Kindle deals. I chose it strictly by chance but would later discover that the author, Gaston Leroux, was the original author of Phantom of the Opera. The story, as it turns out, is one of a series that follows the exploits of Joseph Rouletabille, a French reporter/detective. In this case he is brought to Russia by the Czar to protect General Trebassof, whose assassination has been plotted by the revolutionaries—the Nihilists. Rouletabille is aided along the way by Matrena Petrovna, the wife of the general, whose allegiance to her husband defies the boundaries of human explanation. Like much of the prose, I found this passage to be exhaustive but not particularly telling, in terms of character development. There are, moreover, more characters to the tale than one can keep track of without notes; many introduced in a massive name dump in the opening pages. This, of course, is an attribute of all Russian novels, given the complexity of Russian naming conventions, but comes off as extreme here, where many of the characters play no central role. They appear to exist solely for the purpose of description. In the end, I concluded, the writer does not develop characters so much as character types. This gives the story diversity of characters but not character itself. It strips many of the names of the personal identity I find endearing in the greatest novels. The dialogue, moreover, can likewise seem excessive, pushing into the arena of intellectual cliché. The narrative, as a result, often seems akin to forced flourish and, in the end, superfluous to the story. He writes, for example, “Two windows reaching to the floor let a wan light creep with difficulty through their dirty panes, making a vague twilight in the room. Soon nothing could be seen of the motionless figures against the wall, much as the faces fade in the frescoes from which the centuries have effaced the colors in the depths of orthodox convents.” And these are all “extras,” in the drama, crossing, to my taste, the fine line between illustrious and tortured. The tale is interesting enough and the mystery is retained despite the frequent tease that the final reveal will occur on the next page. In the end, however, the mystery cannot be untangled in a single chapter, much less a single page. The explanation drags on in a way that could not be more anti-climactic. It loses, in the process, any sense of credibility. For those who enjoy this kind of historical detective stories this book may be worth the small investment. It has some entertainment value. Leroux, in this case, comes off as a sound journeyman, but a journeyman nonetheless. The magic of Phantom is not replicated here. This review has been hidden because it contains spoilers. To view it, click here. Παρά τον αρχικό γρήγορο ρυθμό, έχασα τον ενδιαφέρον μου περίπου από τη μέση και μετά και το τέλος δε με ικανοποίησε. Η αθώωση του υπόπτου προσώπου γίνεται με βάση τις παρατηρήσεις του ερευνητή, που ο αναγνώστης δε μπορεί να γνωρίζει· τις δέχεται. The third Joseph Rouletabille thriller has a few moments of greatness, but never really comes close to matching the excellence of the first two novels. Somehow the threat of unknown, unseen terrorists and assassins cannot match that of one lone murderer. J'aime beaucoup le personnage de Rouletabille, et c'était la première fois que je lisais une des oeuvres originales (je n'avais vu que des adaptations cinématographiques avant ça). Le vrai bon point est que j'aime autant le personnage en livre qu'au cinéma. Maintenant, je ne sais pas si c'était le meilleur livre par lequel commencer, vu que j'ai trouvé assez difficile de s'attacher à la mission de Rouletabille dans ce roman. Protéger un homme ? Noble mission, bien sûr. Protéger un homme qui a fai J'aime beaucoup le personnage de Rouletabille, et c'était la première fois que je lisais une des oeuvres originales (je n'avais vu que des adaptations cinématographiques avant ça). Le vrai bon point est que j'aime autant le personnage en livre qu'au cinéma. Maintenant, je ne sais pas si c'était le meilleur livre par lequel commencer, vu que j'ai trouvé assez difficile de s'attacher à la mission de Rouletabille dans ce roman. Protéger un homme ? Noble mission, bien sûr. Protéger un homme qui a fait fusiller des étudiants par dizaines, voire par centaines ? Moué... Même si le personnage de la Générale est touchant, j'ai eu beaucoup de mal à vouloir que Trébassof s'en sorte, surtout après l'histoire du père (view spoiler)[ duquel on a fusillé le fils simplement parce qu'il était en habits d'étudiants (hide spoiler)]. C'est vraiement le problème majeur que j'ai eu avec ce roman, mais il faut aussi prendre en compte la différence d'époque. Convoluted plot. Well worth the time to read. Diabolical main character. Evenly paced narration performed by Don W. Jenkins. Recommended. the narrator of this edition seems to think that French and Russian accents are the same accent. i wish i had read the print version of this one rather than listened to it, as the audio colored my judgement of the story. Leroux does the slow, meandering build that is stylistically consistent with mysteries of the time, and which i have enjoyed in his other work, but the grating narration imbued me with a desire for the book to hurry up and end already. There was to much surrealism in it for my taste.